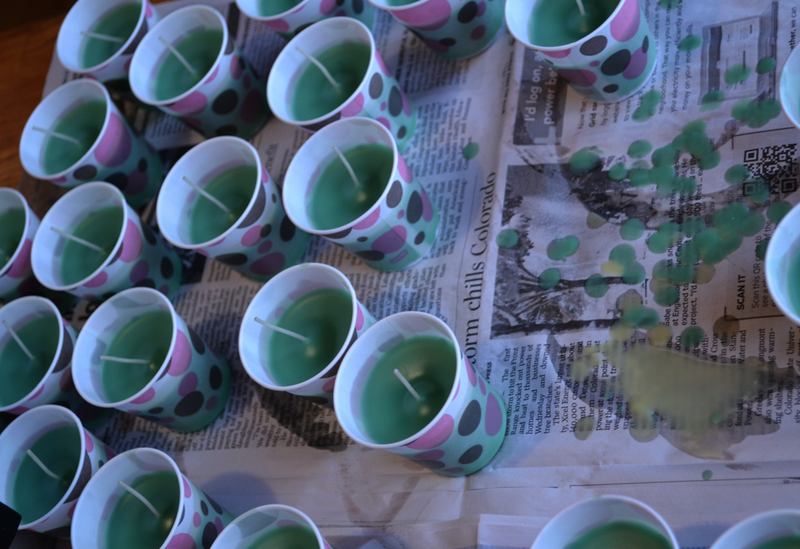 I've tweeted quite a bit lately about the various votive candles I've been making and while doing so have received several requests for a tutorial. Y'all, I'm not sure I can do this. But I'm willing to try. Here goes. First off, a little word of caution: This is not a cheap hobby. It IS a cheap gift enterprise should you so embrace it, but the start up costs can turn away someone who just wants to dabble in this once or twice. For you I say, go ahead and read through this. I'll try to give a cheaper alternative when I can think of one. 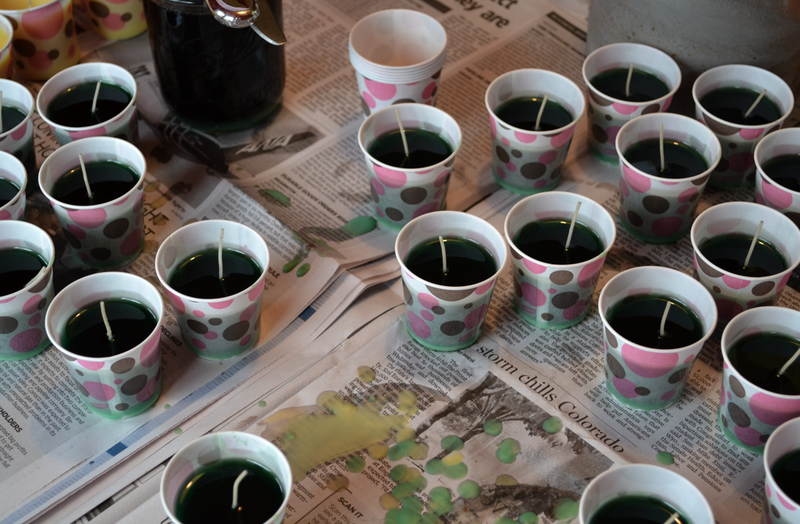 Some 11 years ago I attended a demonstration on how to make container candles given by a gal from the church we went to at that time. It was lovely and seemed right up my alley. I could see myself doing this for a long time and so…I bought the supplies. I've never once been sorry I invested in all this stuff because I'm still using it all, 11 years later. 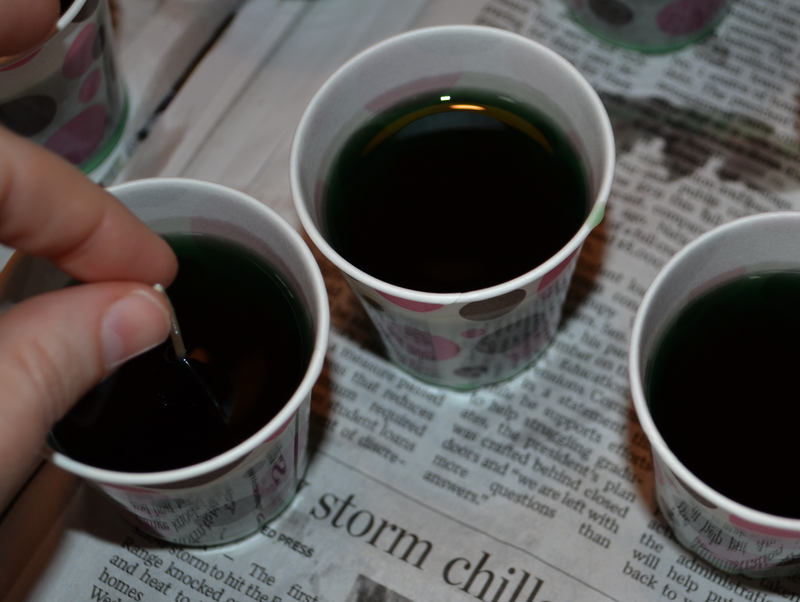 I showed two friends how to make candles and they, too, purchased supplies. They are NOT still making candles 11 years later and have since either sold off or given away their supplies. So think about it carefully before you dive in. Okay, word of caution over. Now, how do we actually do this? 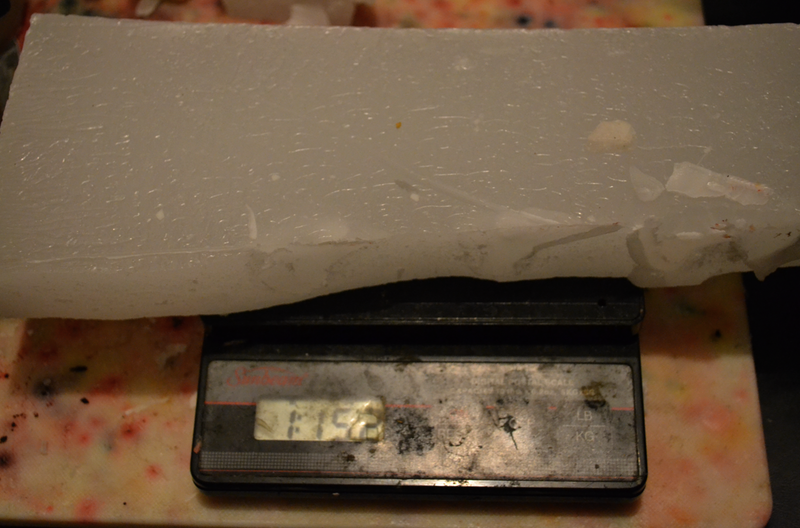 A scale or some other way to weigh/measure the wax. Eyeballs can work, but I prefer numbers. When I first started, I didn't bother with this pot. Instead, I used my $50 Calphalon. BIG MISTAKE. 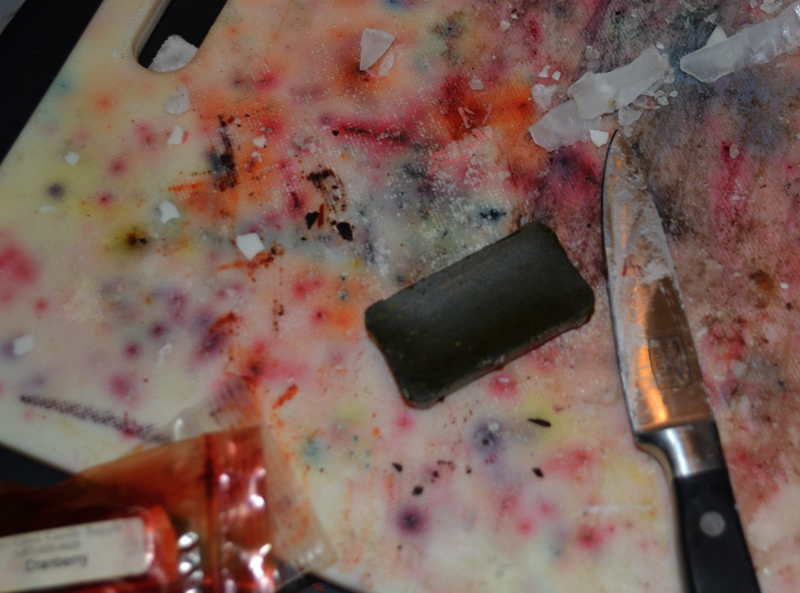 Wax WILL get into your pot. Buy a big cheap pot instead. Save your Calphalon for spaghetti. 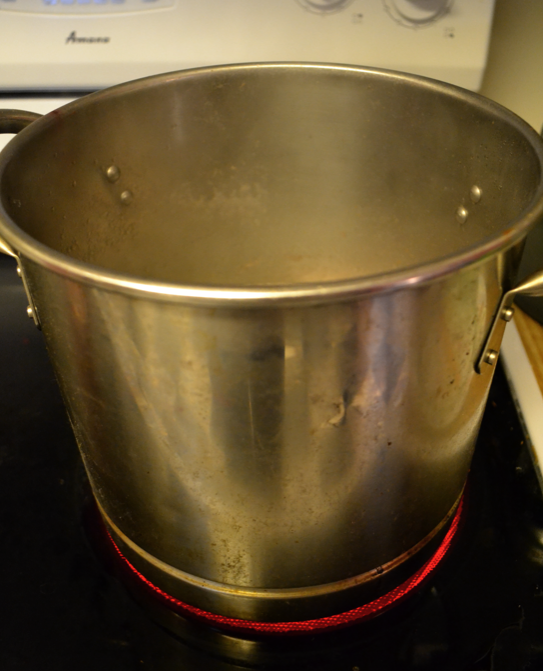 (I was thankfully able to salvage my Calphalon and I immediately went out and bought this pot for candle making.) 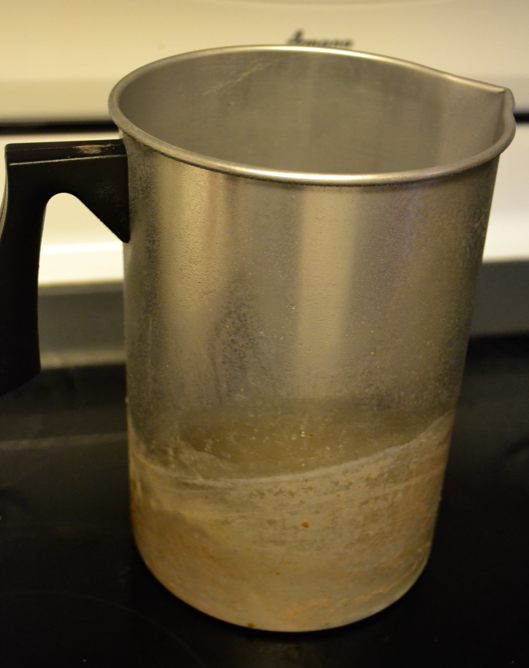 So now, take your big (CHEAP) pot and fill it about 2/3 to 1/2 of the way with water. 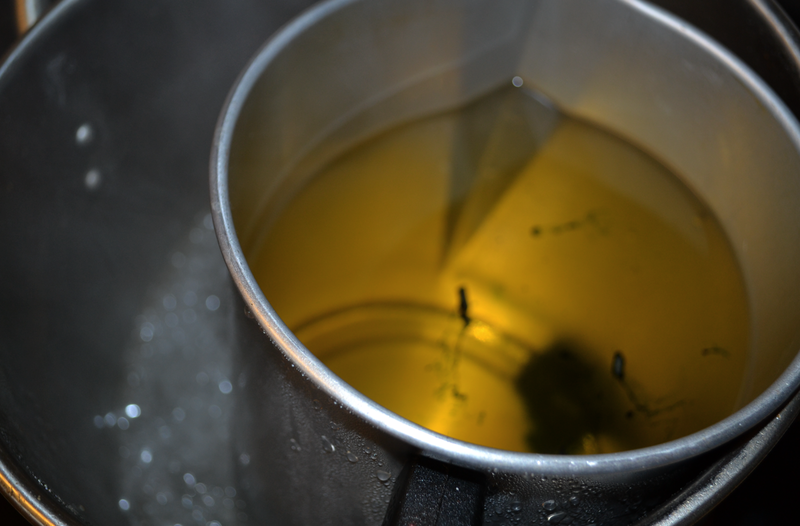 Bring that water to a boil. I like to keep the heat around medium or just above. 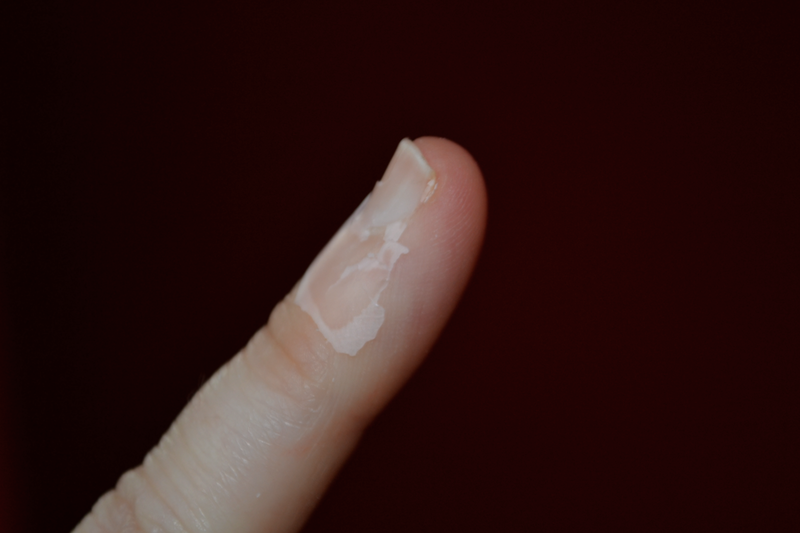 When I first started, I used only parafin wax. 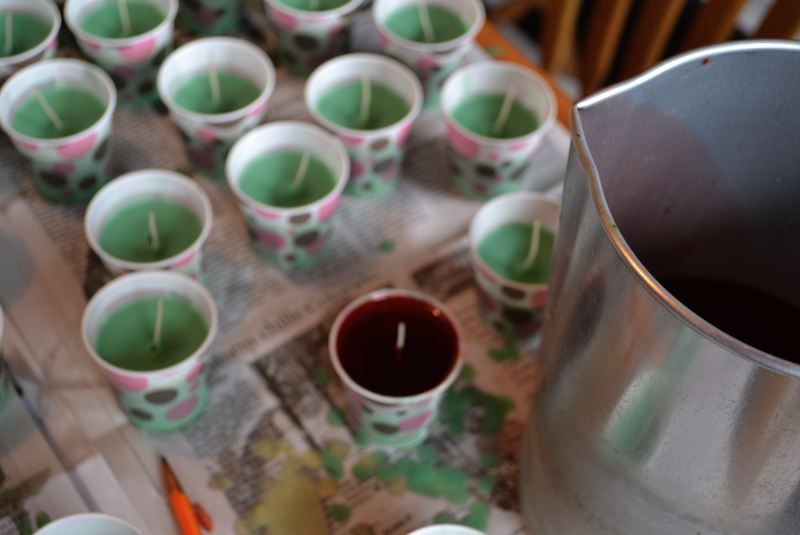 A few years ago I learned of some controversy surrounding paraffin candles. Apparently soy was the way to go. 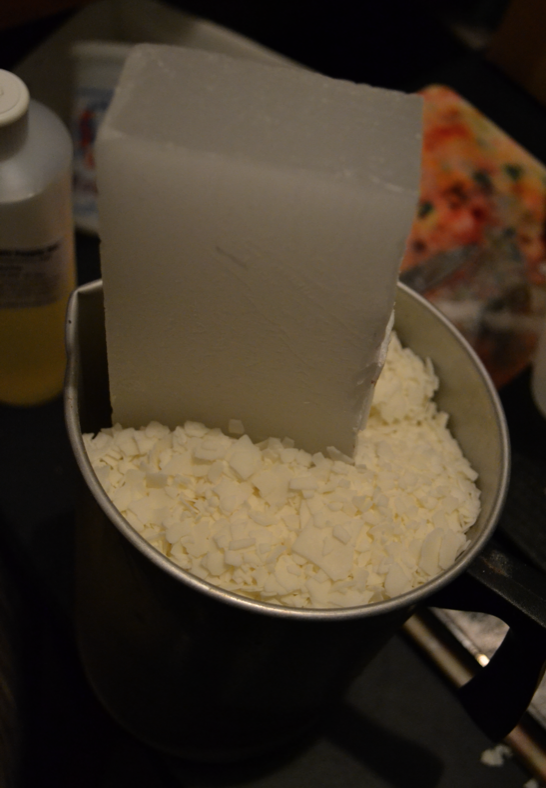 I bought a ginormous box of soy wax flakes and made my first few batches. They looked weird. 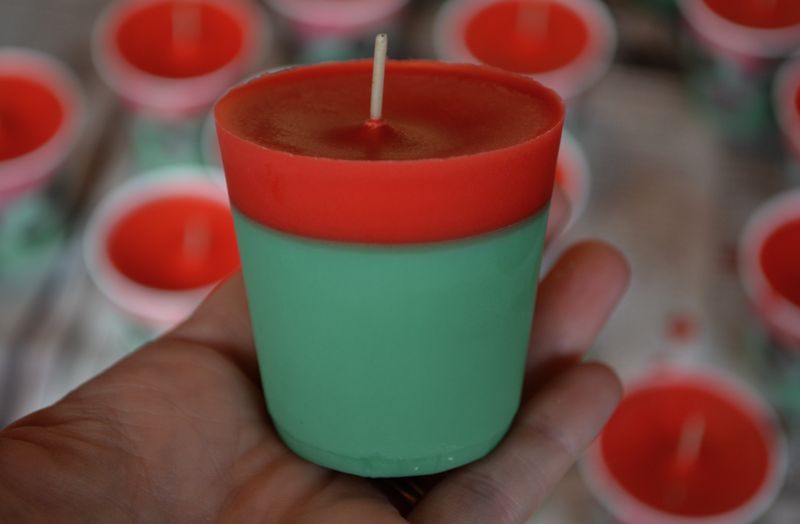 The texture was off, it was harder to get the color right, and the kicker – when I lit a finished candle, the flame burned straight down to the bottom of the wick. It's called "tunneling" and it's not a good thing. I decided to mix both soy and paraffin in equal parts. 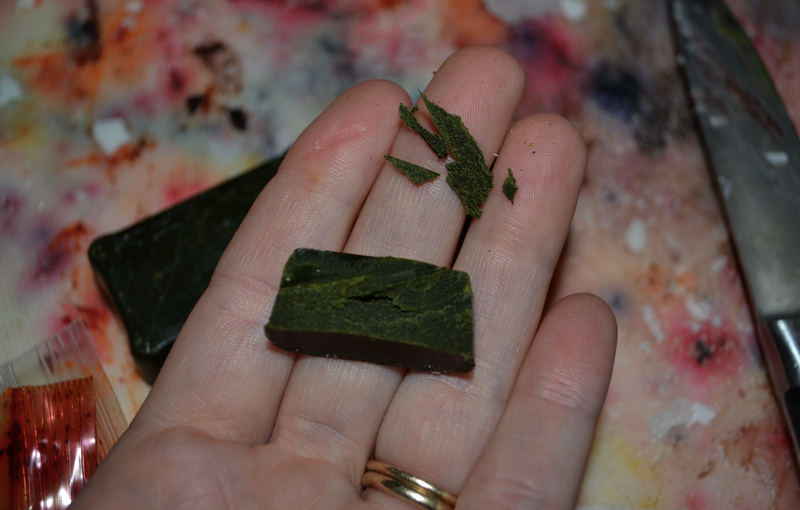 Presto – the texture and color were back and the tunneling was gone. For better or worse, this is how I do it. 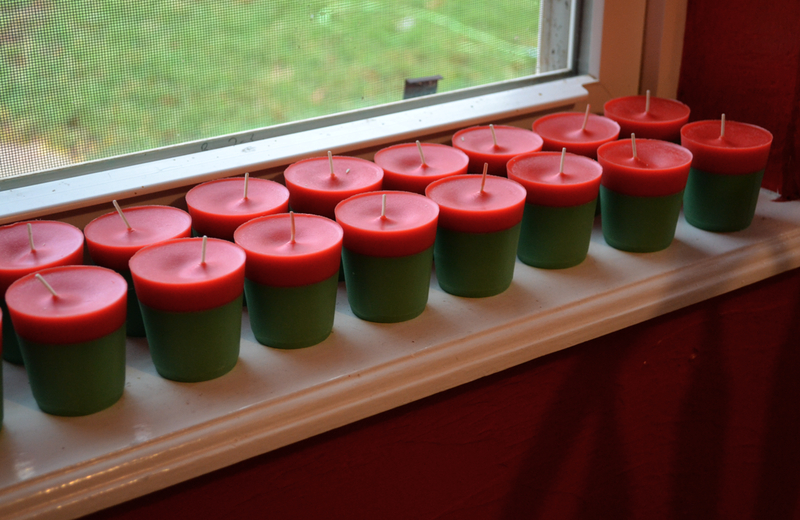 I'm open to suggestions on how to make all-soy candles without a major disaster. Until then, this is what I do. 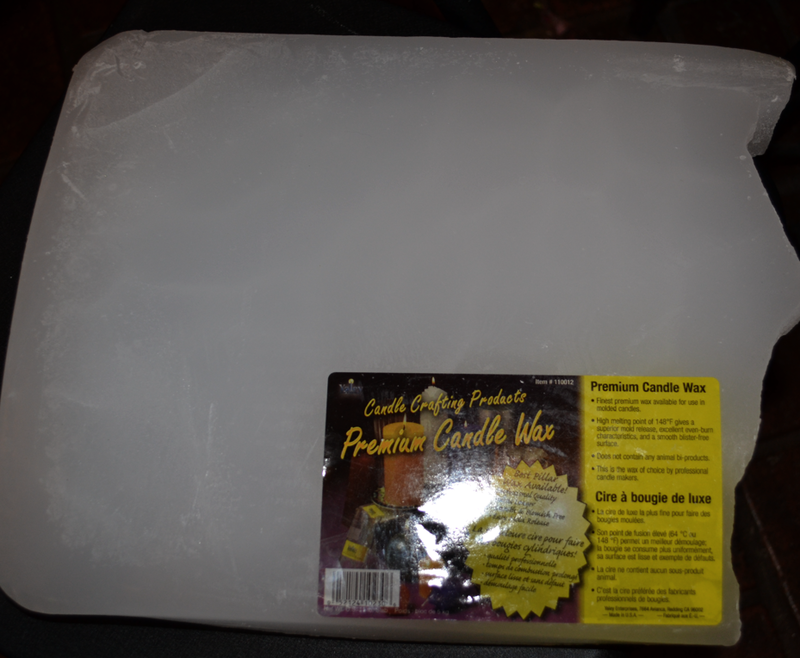 This wax has a melting point of 122 degrees Fahrenheit. That melting point is important to know about. You could potentially set your house on fire and I don't want anyone blaming me for that, okay? Use a candy thermometer if you need to. I used one for several years. I don't use it anymore, but that doesn't mean I shouldn't. If I burn my house down while making candles, it's my own darn fault. Ditto to you. The pouring pot I show above is a 4 pound pot. I certainly try to not go over 4 pounds of wax, for obvious reasons, in fact, I will often keep each type of wax to 1 pound, 12 ounces. FYI. 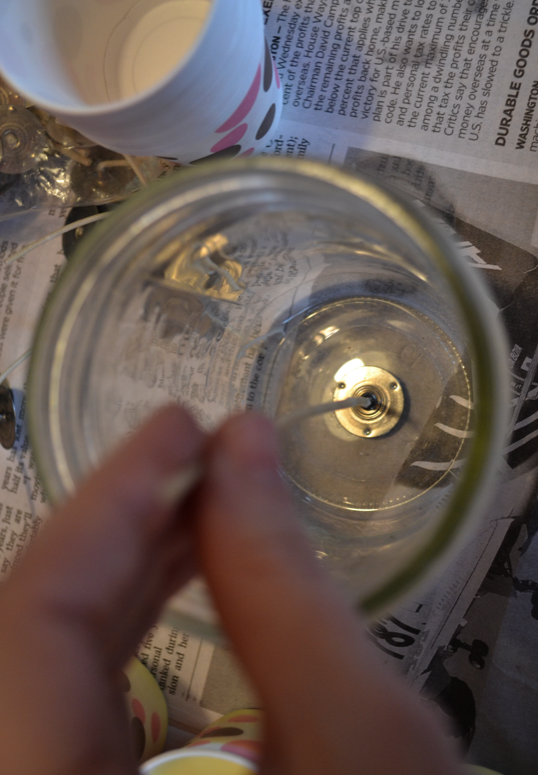 The block of paraffin is trickier to break off. I used to keep it in a cardboard box and pound it to death with a hammer. 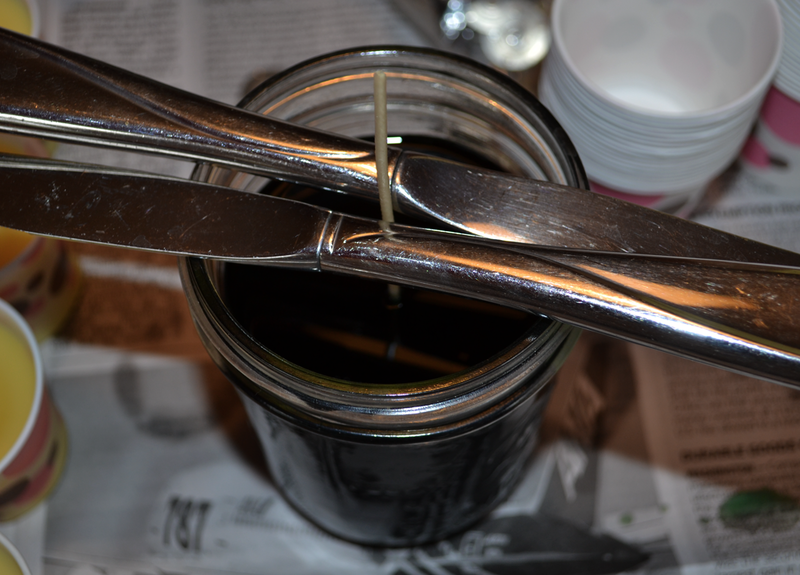 No reason the wax has to look pretty – it's going to be melted soon, right? I'm now more apt to put it on my candle cutting board and stab it with a knife. 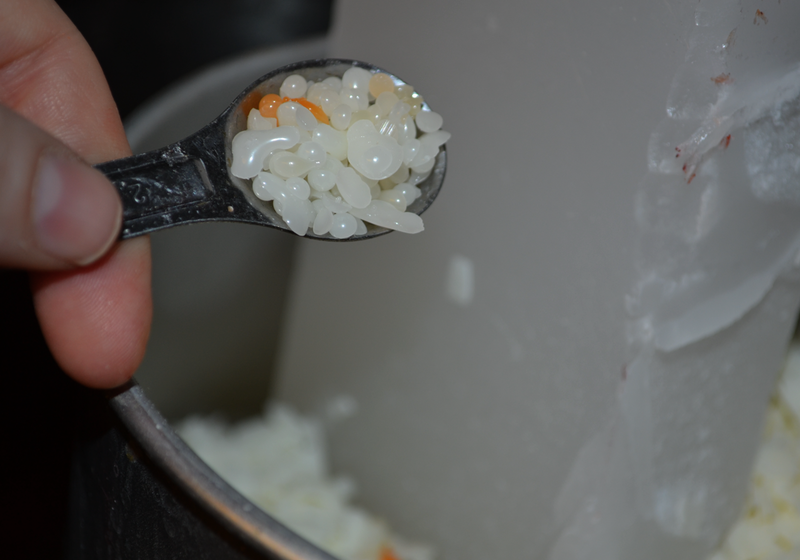 You can score the wax where you think it should go (the old eyeball method) and then wiggle the knife through it in about three or four places up and down that score line. It should break off for you similar to what you see above. Don't be alarmed – I know that looks like I've made a huge mistake, but it does all melt down. I promise. This is the time to add some vybar too. Vybar is an additive. 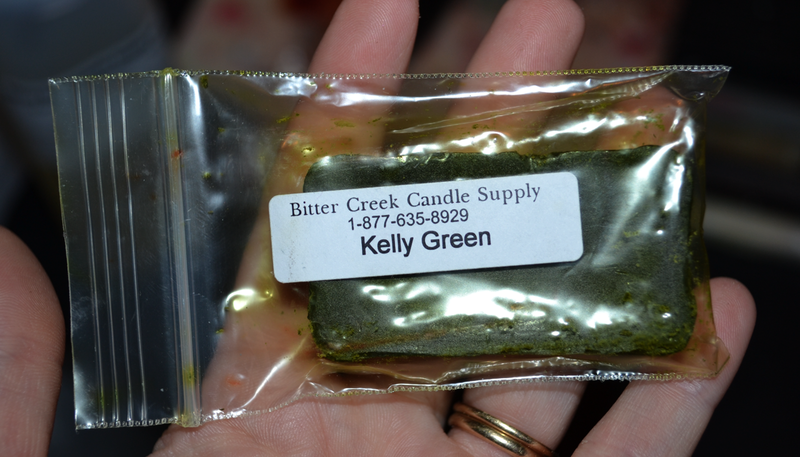 It makes the color consistent throughout and according to Bittercreek Candle Supply, it improves "flow, hadnress, strength, color dispersion, and fragrance retention." It's typically used in paraffin candles and, well, I'm using half paraffin here, so there you go. 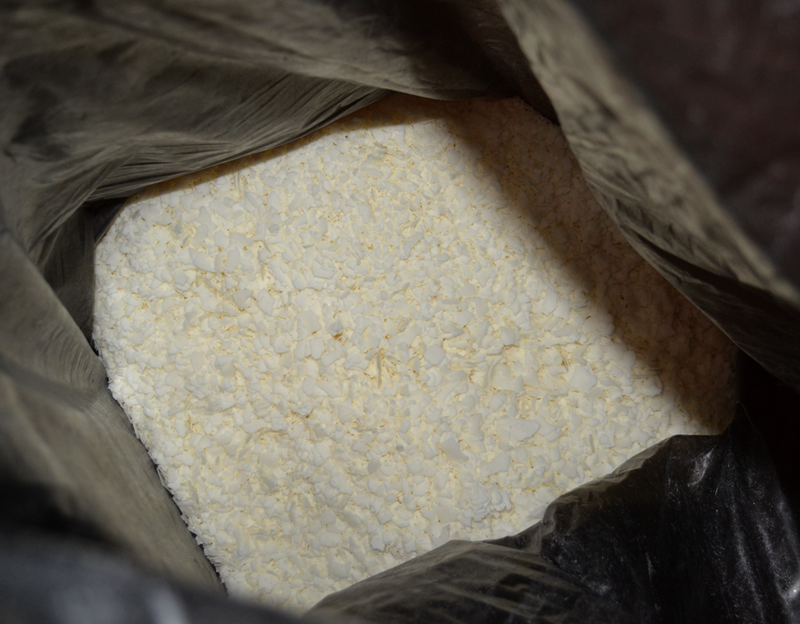 It looks like tiny white plastic pellets. 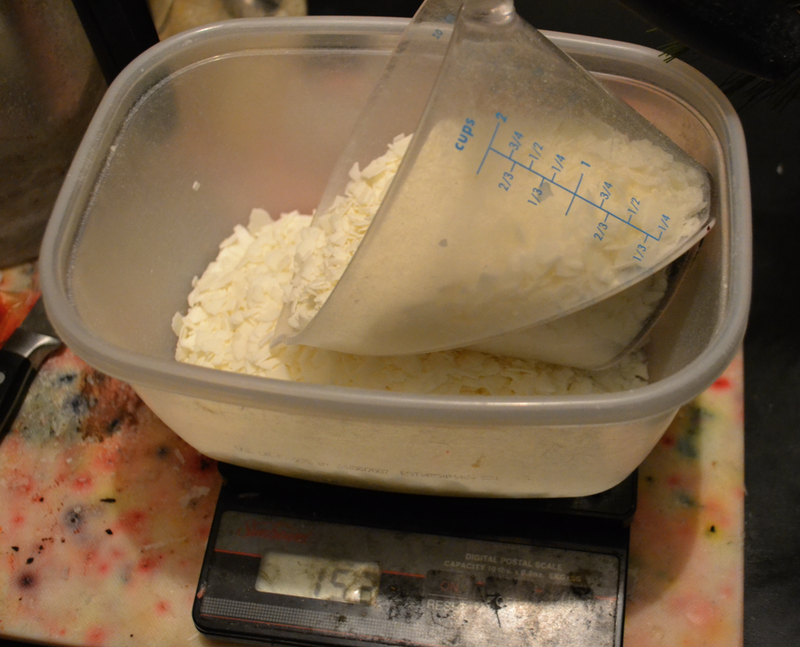 For this amount of wax (3.5ish pounds) I put in about 3 teaspoons of vybar. Good, it's all melted now and ready to go. Time to decide which scent you want, and along with that, which color. I think I'll make these Christmas Tree scented. What color, what color, what color? Hmm…how about GREEN? 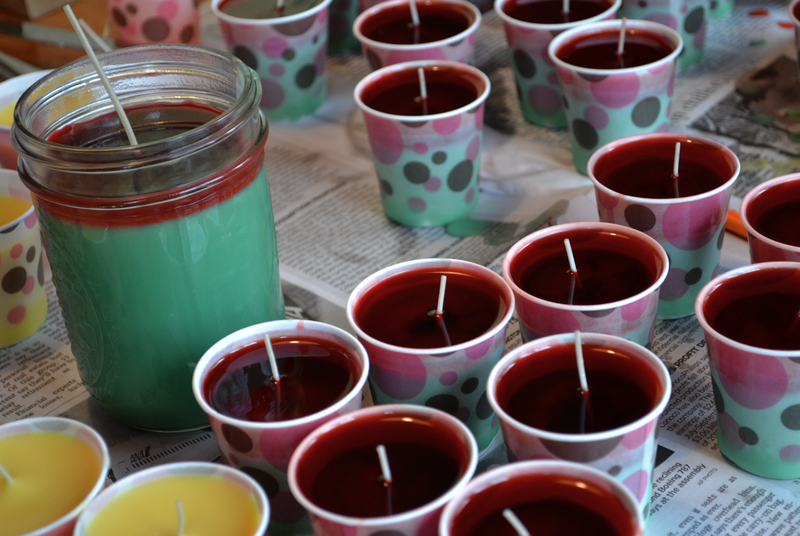 You can buy dyes for candles in a variety of ways. I happen to prefer the blocks like you see above. Now you need your cutting board and knife again. When I first started, I didn't realize I was sacrificing my only cutting board to the cause when I used it to slice the color blocks. So if this is a one-time shot for you, use a cardboard box or something. Don't give up your cutting board! If you plan to do this for a while, go ahead and give up your cutting board, or else buy a cheaper one to keep with your candle supplies. Hmmm…let's see what this does, shall we? 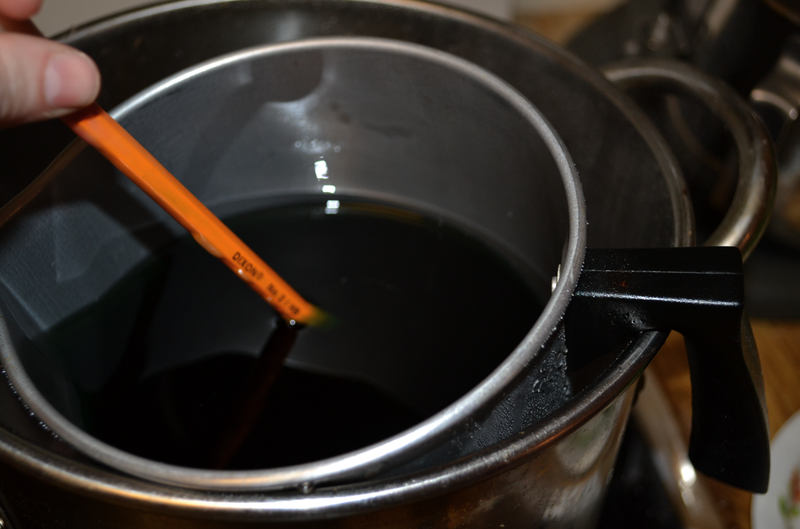 After you think the color block has all melted, stir the pot a bit to make sure it gets evenly distributed. Here's where a wooden stirring stick comes in handy. Of course, I don't happen to have one just now, so I'm using a pencil. Hmm. 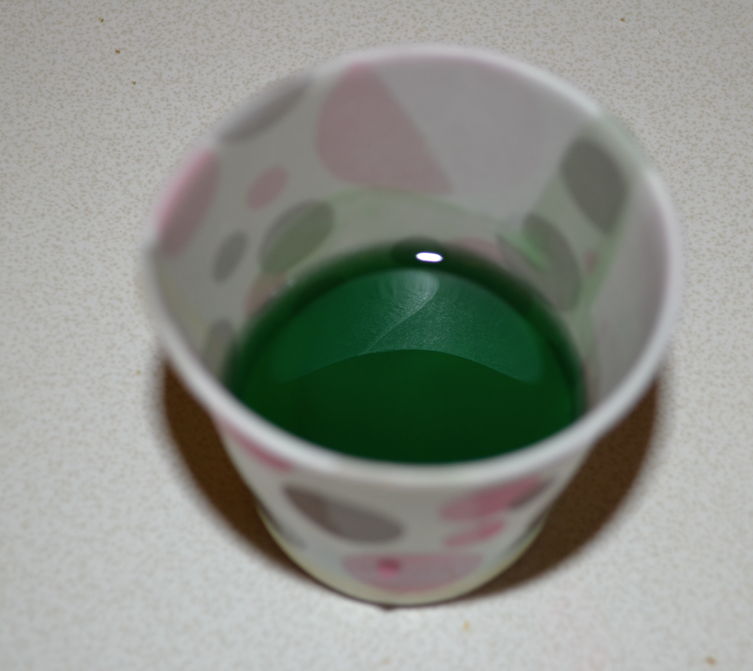 Not exactly Christmas green, is it? Okay, so I'll add some more color. No problem. MUCH better. 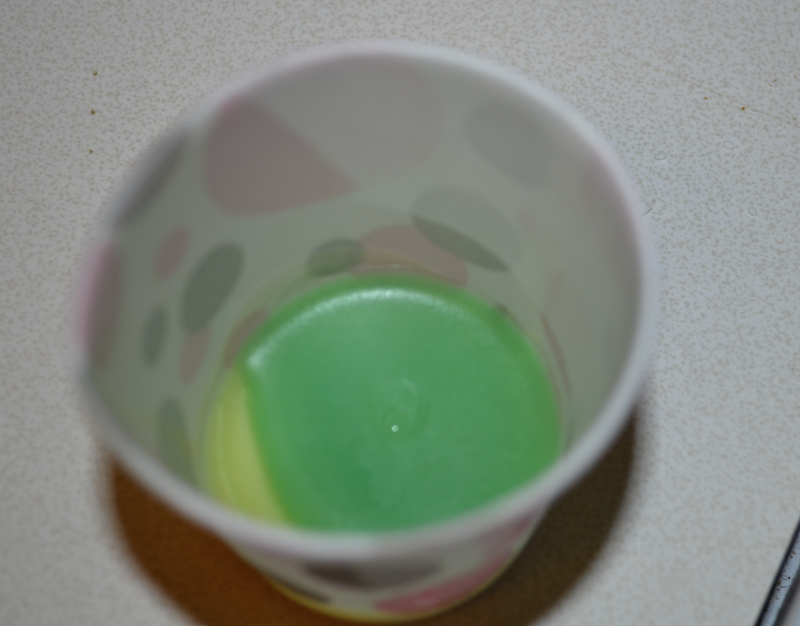 You can see it's still liquified in this photo, but I can tell it's going to be darker so I'm going with it. Now, add the scent. For a pot this big (3.5ish pounds) I use 9 Tablespoons of scent. 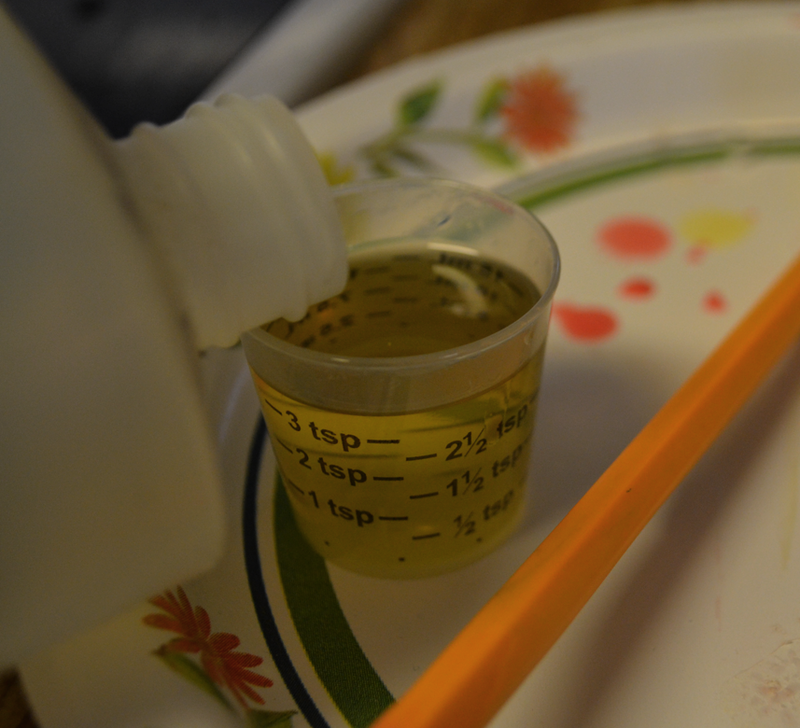 I usually use a metal measuring spoon, but couldn't find one on this day, so instead I used a medicine cup. 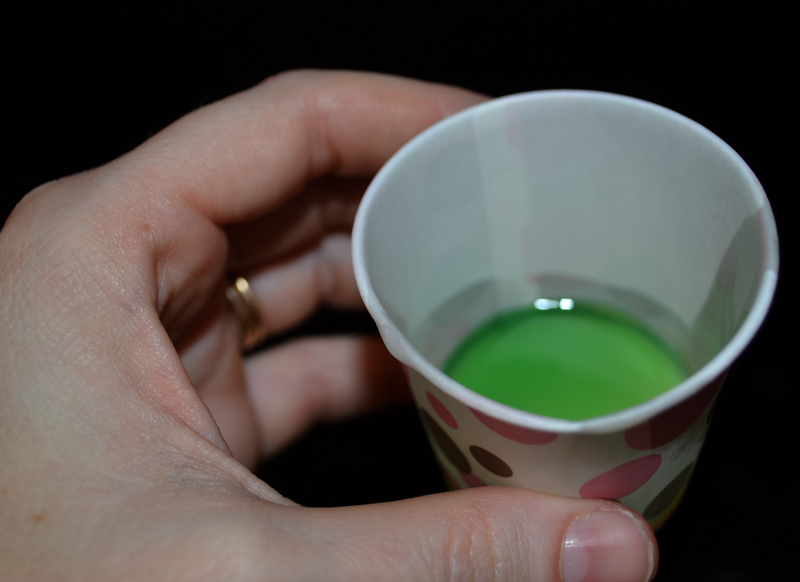 It could be one of my better "mistakes" – I think I will always use a medicine cup from here on out. Okay, so we all know that 3 teaspoons = 1 Tablespoon, right? Tell me you knew that already. Okay, so fill this puppy up 9 times and pour it in the wax. **IMPORTANT** If you are doing this over gas burners which are giving off an actual flame, do me a favor, would you, and turn the burner off at this point? This fragrance is flamable and if you spill it on that flame… you might start a fire and I'm pretty sure I made it clear above that you DON'T want to do that. After you add the fragrance, stir the whole thing again with your wooden stirring implement of choice. Now you are ready to pour. 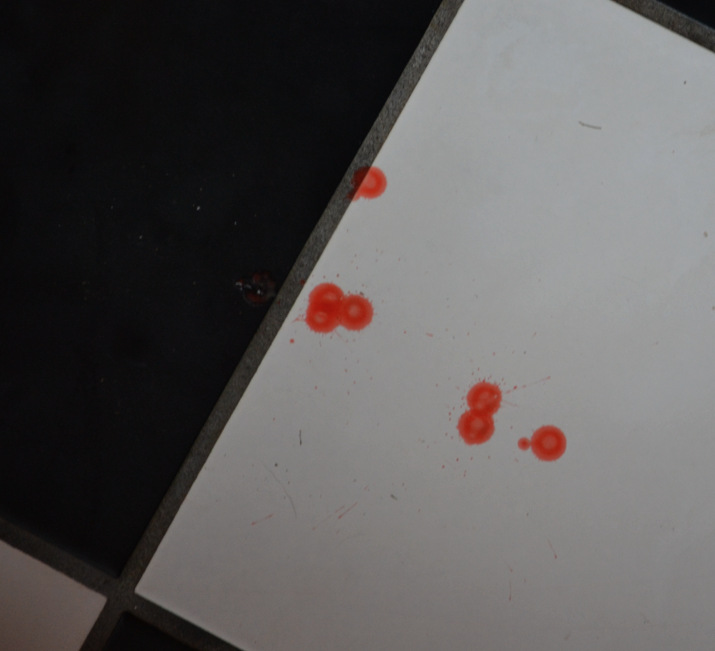 Make sure you've protected your table or counter top with newspaper before you do this. 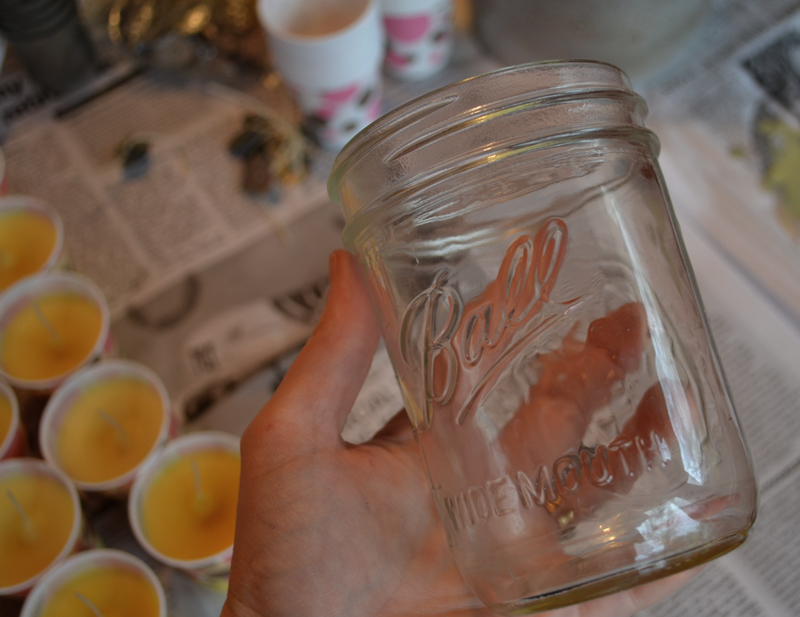 Get your containers together be they actual candle jars, Mason jars, small votive holders, or Dixie cups. 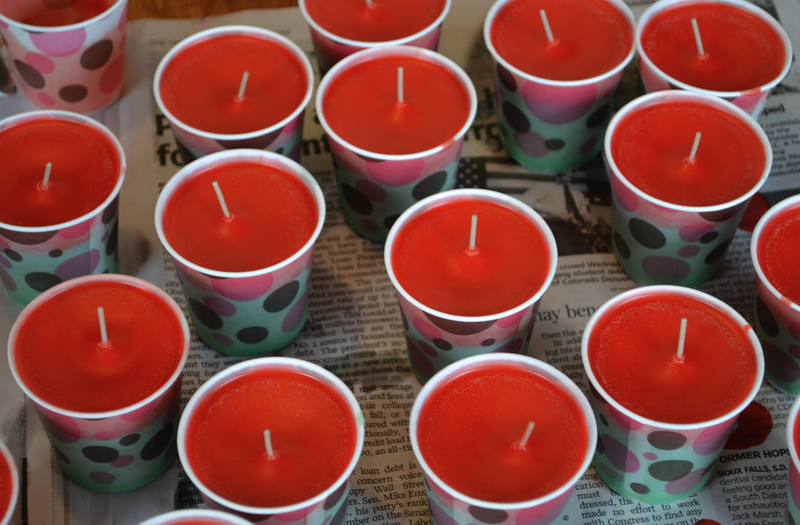 I like to make votives out of Dixie cups because they make nice, big votives and I save on the expense of providing the container. 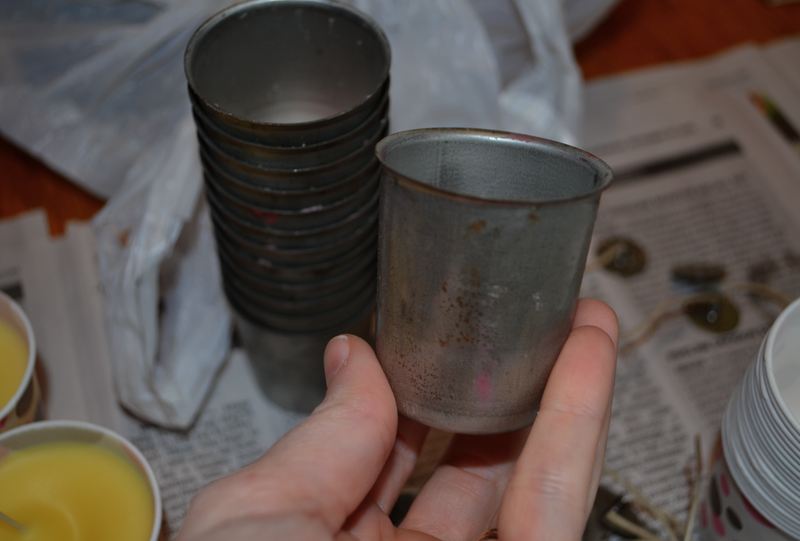 You can also buy metal votive molds and I have a bunch of those too. I use them when I need to make a ton of candles in a hurry. They work great, but I don't think they are as pretty as their Dixie cup sisters. 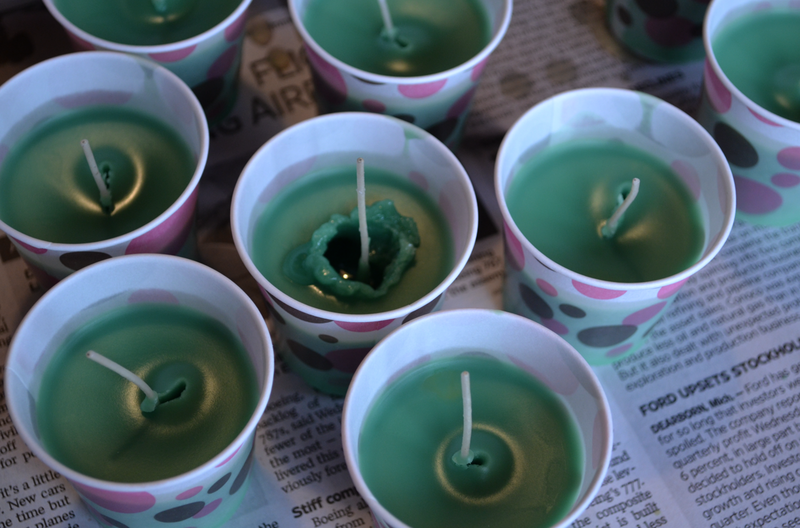 PS – If you do end up going the metal mold route, here's a hint: After the candles harden, pop them in the freezer for 5-10 minutes. 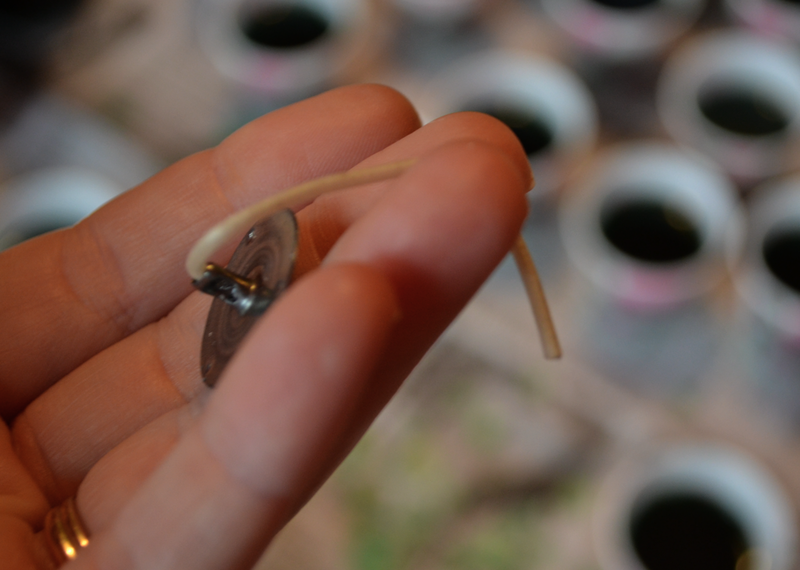 They will slide right out of the mold just by pulling up on the wick. It appears they are no longer sold with the lids at Bittercreek Candle Supply. The last time I purchased these (it's been a while), the lids came with the jars. 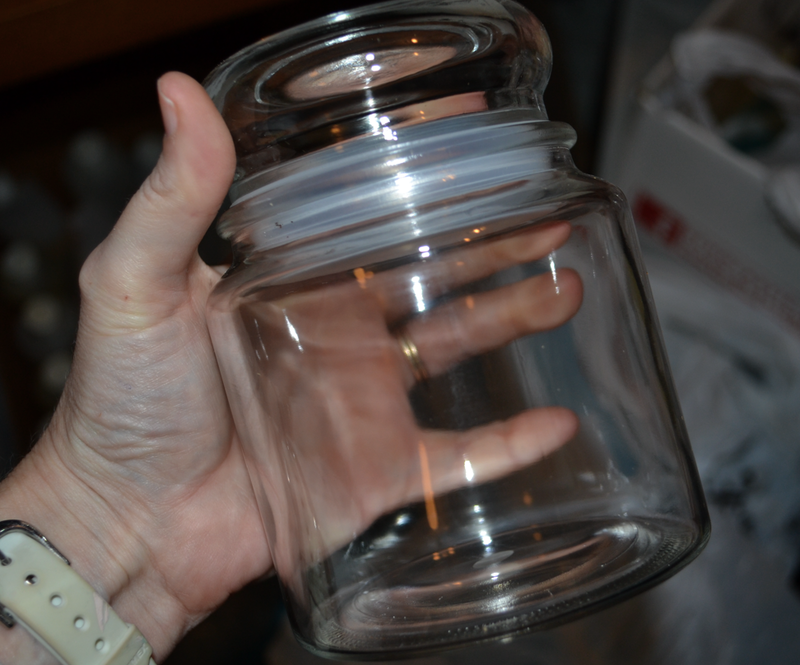 I like the big apothecary jars to have lids, but I hardly ever used the lids with the small 4-ounce jars, so that's actually good to know. 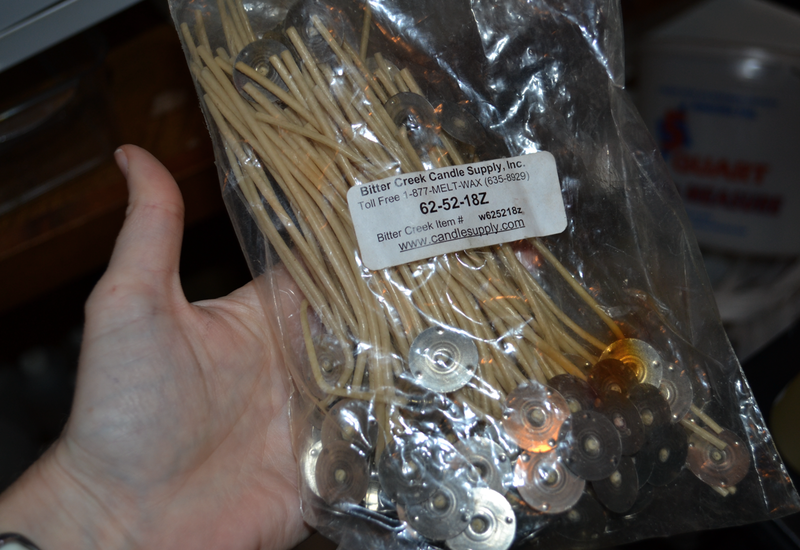 I used to have a supply of wick stickers – basically a double sided foam sticker that you apply to the end of the wick and also the bottom of the jar. I don't have any at the moment, so I just took my chances. For both the Mason jar and the Dixie cups, I left quite a bit of space at the top. 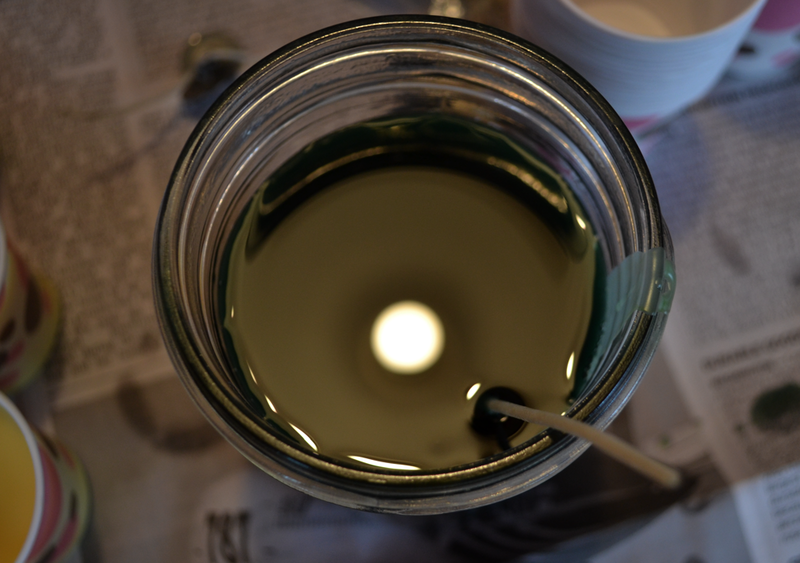 This is because for my second pour I'm going to change the color and want that layer thicker than I would normally do with a one-color candle. 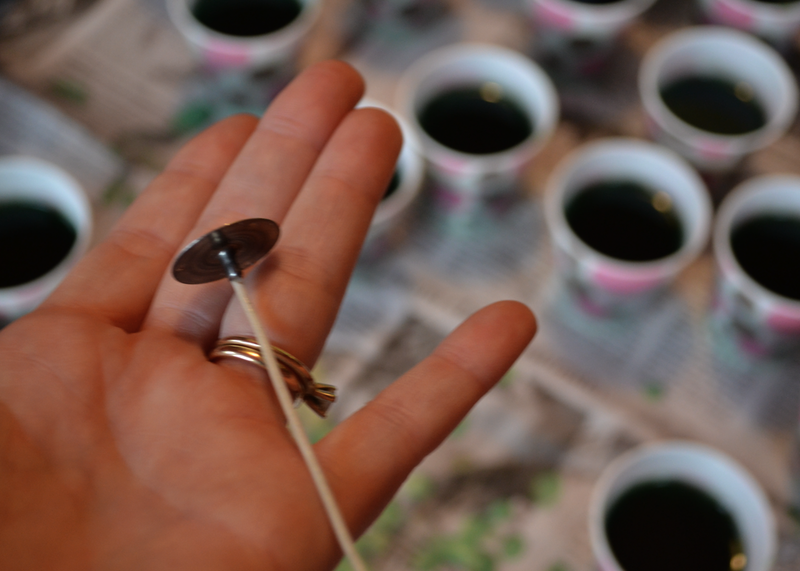 Note on the two-pour method: With all paraffin, you have to do a second pour because the wax shrinks up and dips in toward the wick. With all soy, you don't have to do a second pour. 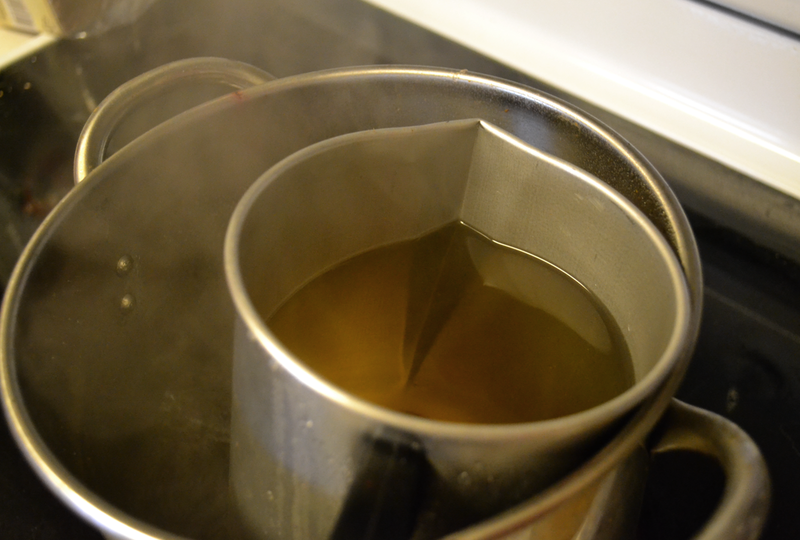 With the soy-paraffin blend, you still have to do a second pour. Now that you have all the wicks in you can just walk away for a while. Let them cool and harden. When they cool the wicks may or may not be in the center of the candle. You gently tug it across until it is centered. 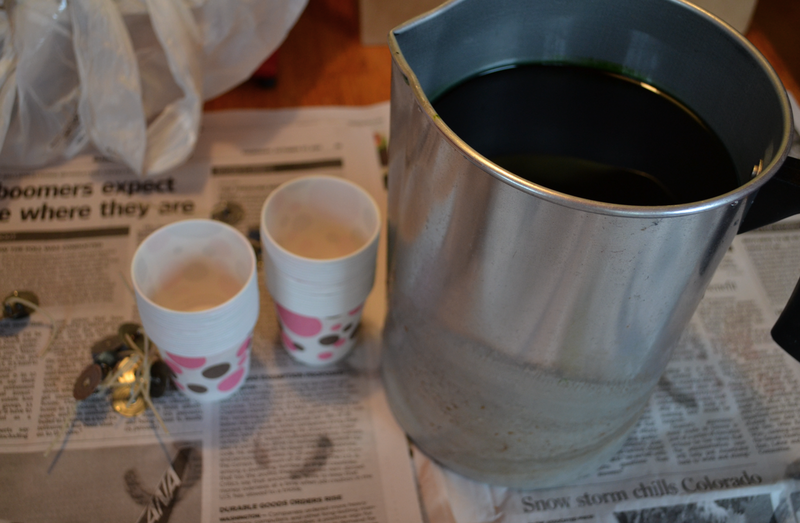 You will make an indention in the wax, but you still have a second pour, so it's all good. Again, the second pour is your friend here. Now we wait. 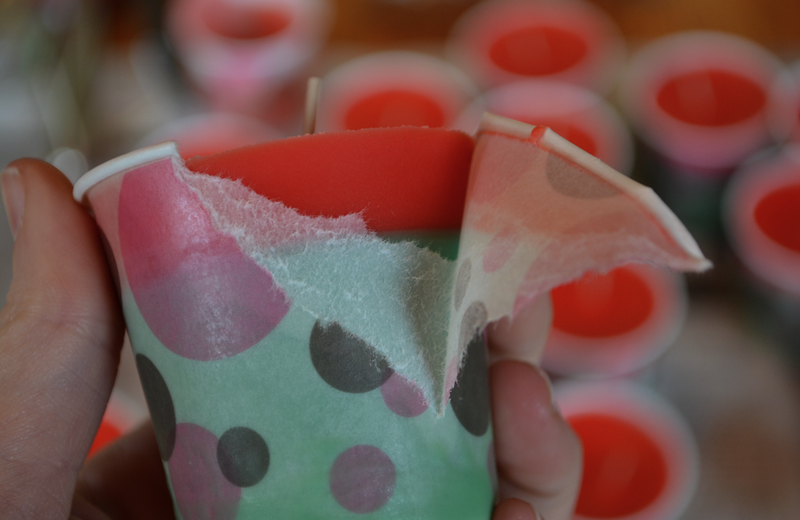 It's important to make sure the candles are completely set before you remove the Dixie cup (or try to pull them out of a metal mold). Trust me on this. And presto! Isn't it cute? I have a lot of scent and color options. My favorites to do, particularly this time of the year are mulled cider and orange cranberry. I recently discovered honey suckle and LOVE it. It's awesome. 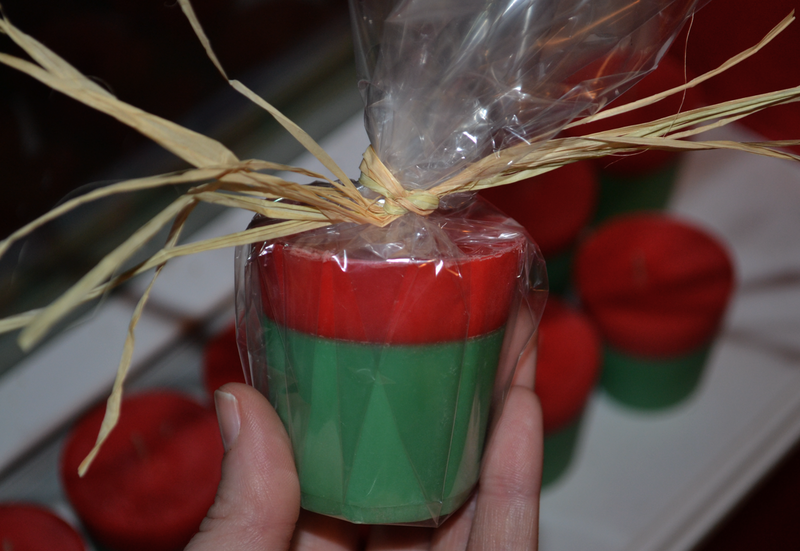 I also have a baby powder scent and sometimes make these in baby blue, pink, or green and use them as baby shower gifts. 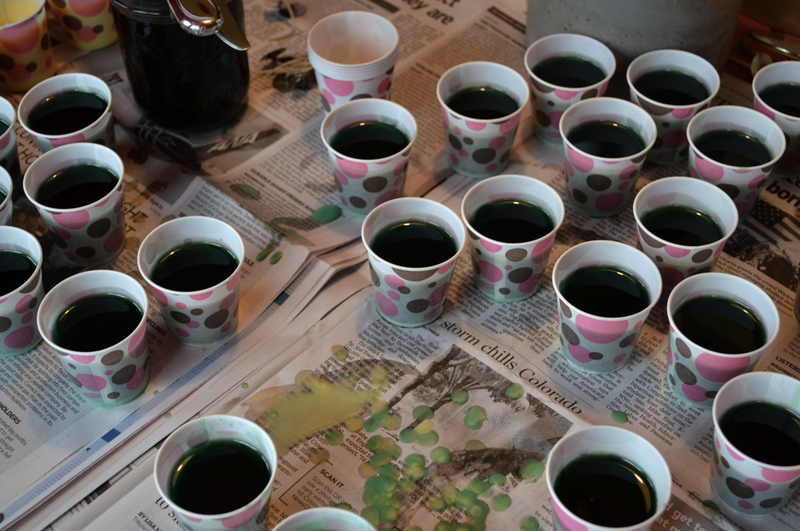 One more thing – these votives must be placed in a container to burn. They will melt all over your table if you don't do that. As such, I usually slap a caution sticker to the bottom of them after I wrap them. FYI. Are you going to give this a go? It takes some effort, no doubt about it, but it really isn't that difficult. Let me know if you do it. I'd love to see your finished candles. Feel free to link to this tutorial, or print it for personal use, but please do not copy it whole cloth and post it anywhere else on the internet. It took a boatload of time to put together. Thanks for understanding.